According to the Knot.com, I should be in the process of interviewing caterers, visioning my wedding gown and hiring a wedding planner. hahahaha. Being a control freak with an extensive background in corporate event planning is the best and worst combination when planning a wedding. The only thing that is past due according to the knot is obtaining ring insurance, something I should have done the day after my post-engagement hangover. I'm putting that on my very lengthy list of things to do this week. Thanks to my obsession with Weddingbee.com/classifieds, I have purchased our centerpieces (prior to finalizing our color scheme). Once we decided to get married in New Orleans, there were two decoration items which had to be included in our wedding - lanterns and candelabras. 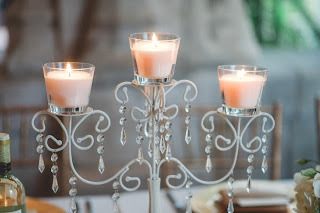 One day while browsing through the classifieds on weddingbee, I found someone in South Florida selling candelabras and other pieces from her ceremony for pick up only. As soon as I clicked on the link, I knew this was meant to be. I purchased my centerpiece items from a sweet girl named Nicole, who gave me an amazing bulk deal for $250. The following pictures are from Nicole's wedding but you will get the general idea. I received 15 of these Ivory Candelabra's which are over 16" high. They are the perfect height for what we are visioning. Amazon currently has them for $22+. If I were to buy these 15 individually, my candelabra total would have been $330. Here are the candelabras on the table. 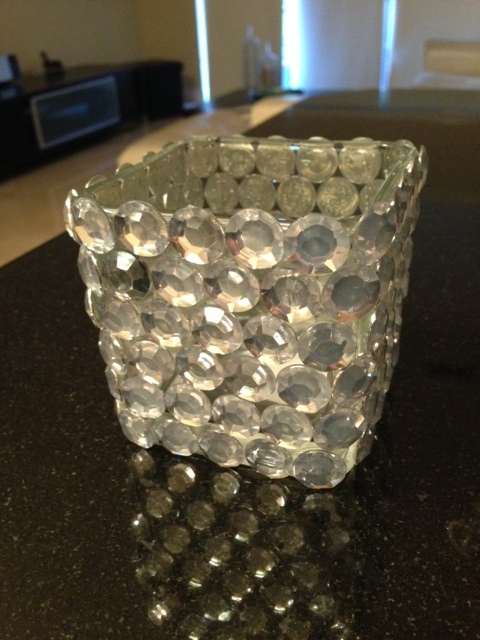 Along with the 15 candelabras, I also received 32 of these Square Crystal Acrylic Beaded Votive Holders . 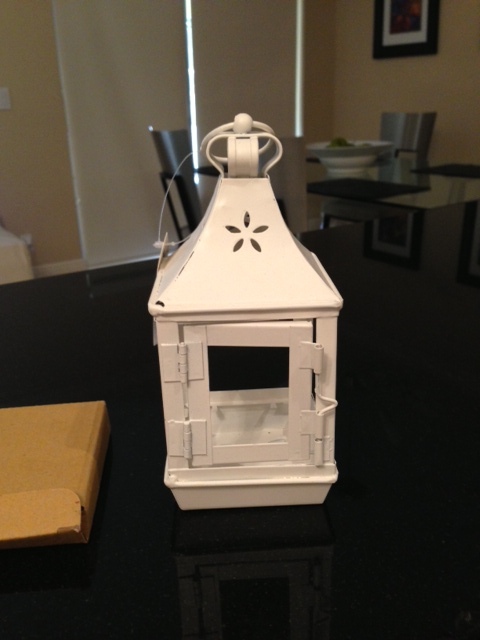 I want to use these to hold smaller bouquets of roses with an led candle lit up. While some may be shocked I purchased all of these items without finalizing my color scheme, I have a general concept of what we're doing. I cannot believe I got all of these items for $250. 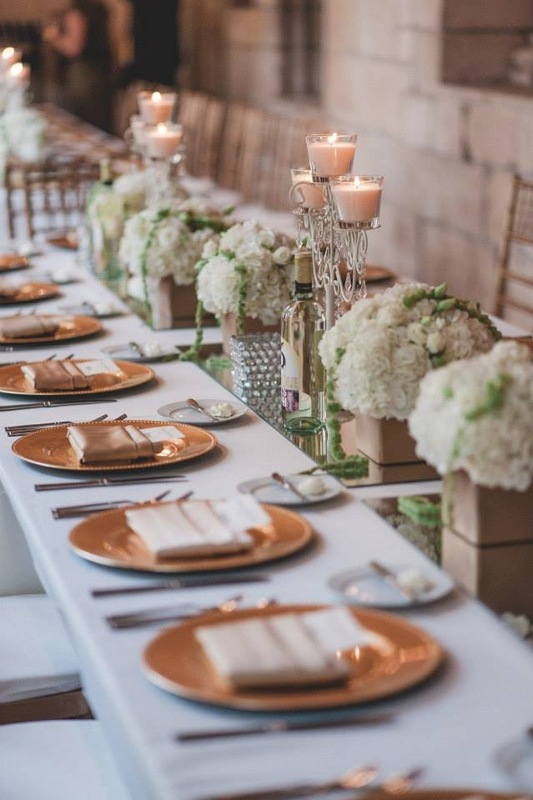 Would you purchase your centerpieces this far in advance if you were getting a good deal? Beautiful!!! You have a good eye! YES, we must find each other at the IFBC!!! Hunt me down :) We have to get up at 3:30 AM to make our flight and arrive at 10 AM. I think I may pass out from exhaustion by noon! Ugh!!!! My flight leaves at 6am so I have to leave the house by 4:45....I thought I had it bad! Are you going to the winery tour tomorrow?? Nice score, Megan! God, I love getting a deal. These are beautiful items. And no worries about not finalizing the colour scheme - these are all metallics or neutrals, so they'll coordinate with whatever colour you choose. Even though I've been married two years now, I still read wedding blogs, just cause I love looking at all the gorgessity. 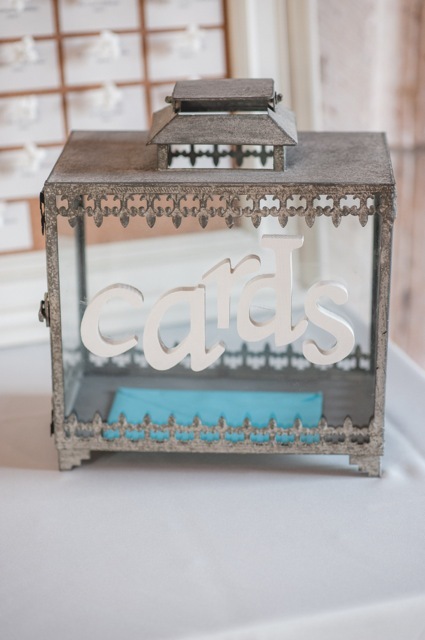 Keep us updated with your wedding planning! Dude...it's really no surprise that you didn't want a wedding planner. You ARE a wedding planner and I think everyone is starting to see that with each wedding wednesday post. Seriously Megan...career in event planning? Has your name all over it. Love the candleabras...they are the perfect amount of romance and goth. Also love the crystal candle holders...despite what Gabe thought, lol. Can't believe the bargain on this stuff. Smart girl.